Receive and send Infrared signals via the Iguana Works USB IR Transceiver. Is there a better alternative to IRControl? Is IRControl really the best app in Other category? Will IRControl work good on macOS 10.13.4? 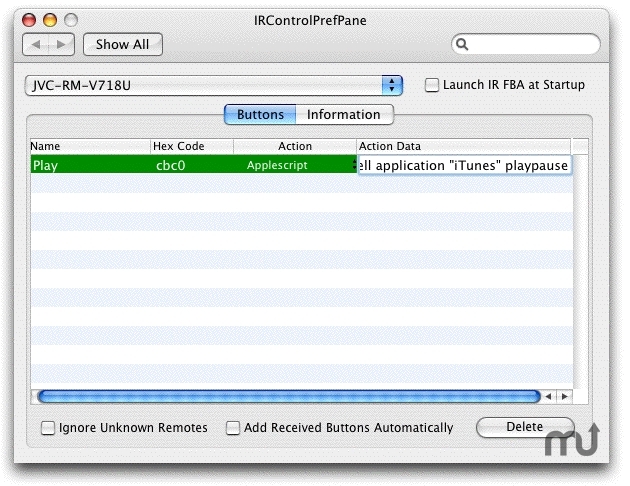 IRControl...The project is a combined MacOS X Preference Pane and faceless background application (FBA) to receive and send Infrared signals via the Iguana Works USB IR Transceiver. IRControl needs a review. Be the first to review this app and get the discussion started! IRControl needs a rating. Be the first to rate this app and get the discussion started! Once the information for a remote has been 'learned,' signals can be sent from the transceiver via an Applescript, letting your computer control other devices via IR. This can be used to replicate the functionality of a Tivo, turning on/off a TV/VCR and changing channels.